The Resolutions of Batavia Castle were created at the General Secretary of the Governor-General and the Council of Dutch Asia (the Supreme Government in the VOC’s headquarters in Asia: Batavia Castle. All 331 volumes from 1613-1810 will be made accessible on line via this section. The original archive volumes are not always easy to read because of fading, ink corrosion or foxing. The head of the former Landsarchief (the colonial state archive), J.A. Van der Chijs, in 1882-86 published in three volumes the 18th-century subject index to the Resolutions, the Realia. The Realia volumes are digitalized and give access to a selection of Resolutions. The Resolutions of Batavia Castle were laminated and rebound during a restoration project in 1978–1982. A number of volumes were split up and the present series consists of 331 volumes. This conservation measure was undertaken by the former Director of ANRI, Dra Soemartini (in office 1972-1991). Thanks to this former initiative, the ANRI-TCF digitalization team scanned the heavy volumes in 2014 without extra paper treatments. 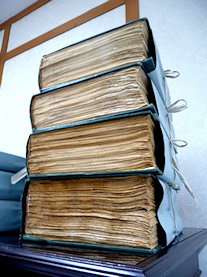 All bindings were removed so that the pages could be scanned as flat as possible. Although high quality scanning was performed succesfully, it was not always possible to reconstruct the original page numbering or dates of meetings. Sometimes folios were missing or wrongly bound. Sometimes folios were double numbered. Consequently, there may be occasional disconnects between the realia database and the scanstore data which the editors have done everything possible to prevent.